On Tuesday (January 22), US chain Villa Italian Kitchen launched its gender reveal lasagna, a $139.99 dish which is coloured blue or pink under its top layer. The brand, which has dozens of restaurants across the US and Mexico, unveiled “the world’s first-ever Gender Reveal Lasagna” on its site, while encouraging customers to share videos of them enjoying the lasagna with the hashtag #LasagnaReveal. The concept was ridiculed by a huge number of people online. Tweeters were mostly astonished or outraged by the latest misstep by straight people. 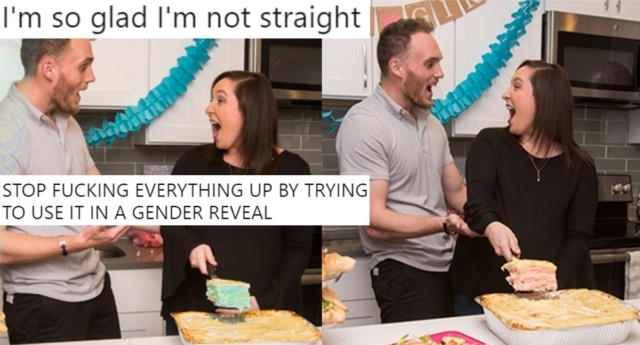 Another person displayed their fury with the idea by tweeting: “Dear straight people: STOP F**KING EVERYTHING UP BY TRYING TO USE IT IN A GENDER REVEAL. One user was moved to point out the cisgender nature of the practice, writing: “Cis people are f**king weird,” while another person felt for the dish itself. “Lasagna deserves better than this,” they tweeted. Hundreds of people had to evacuate their homes during the week-long 47,000-acre ‘Sawmill Fire’ caused by border patrol agent Dennis Dickey. It required around 800 firefighters and $8.2 million in spending to extinguish the blaze. The video showed Dickey shooting a target decorated with the words “boy” and “girl” and containing a legal explosive substance called tannerite, the Arizona Daily Star reported at the time. “Start packing up,” the person filming the video could be heard shouting as the fire quickly spread.